ECAPS introduced a good ol' pupper this semester. Therapists rarely greet their clients with a lick, but Rudy is not a typical therapist. 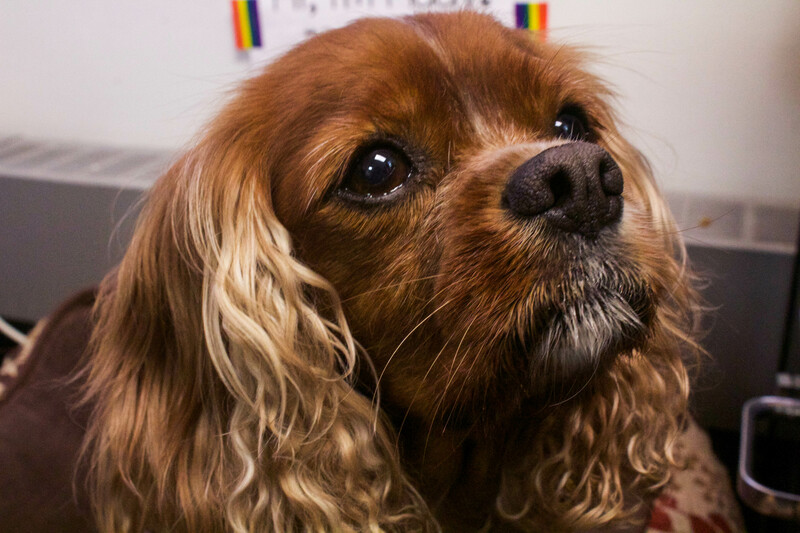 Rudy, the newest four-legged member of Emerson Counseling and Psychological Services (ECAPS), has proved that this unusual approach may be just what students need to feel safe, according to owner Annelle Kallman, one of Emerson’s clinical social workers and substance abuse counselors. Therapy offices can provoke anxiety in many students, Kallman said. She said Rudy turns the counseling center into a more welcoming place. While the cavalier king charles spaniel is lifting spirits, Kallman said, working at Emerson is benefitting Rudy too. She said he loves the attention and can’t stop wagging his tail on their walk to work every morning. Rudy is also making his way around campus, attending events and eating lunch on Boston Common, Kallman said. The canine is catching attention through social media as well. Students can follow his Instagram (@DogtorRudy_at_ecaps) and Emerson Counseling and Psychological Service’s Twitter (@ECCouselingCTR) to keep up-to-date with the pup’s daily routines and whereabouts. The only problem so far, Kallman said, is his popularity. She said Rudy’s visitors make the counseling center in 216 Tremont St. busier, leaving students in need of immediate attention from human therapists feeling more anxious. To address this, Kallman said, ECAPS is working to get Rudy involved with more events around campus—that way all students can enjoy him without disrupting others’ needs. The “dogtor” does not have a permanent position yet, though the pilot program shows his potential in the coming years, Kallman said. She said she foresees additional Emerson student service offices getting dogs. For students interested in visiting the nine-year-old rescue dog, he will be in the office Wednesdays and Thursdays from 8:45 a.m. to 5 p.m. to greet people. Small, 15-minute group sessions with Rudy will also be available Wednesdays from 10 a.m. to 11 a.m.